My goal for 2017 from a fishing perspective is to get out on the water a lot more. With 180 days on the water for 2016, that is a lofty goal. That is especially true because, as much as I love fishing, there are other things I truly enjoy that call for dedicated time as well. Things like hiking, climbing, and photography all compete to take up my time. So, with big goals for 2017, I knew I had to get an early jump. After fishing for the first four days of the new year, I would say I'm off to a good start. 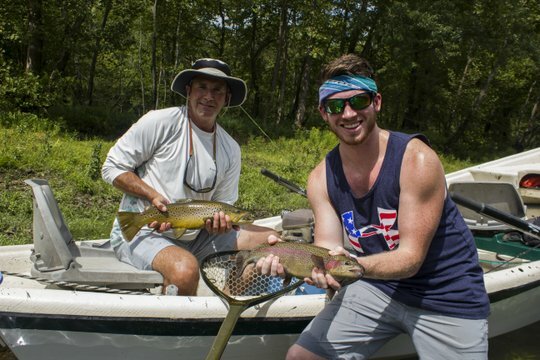 The highlight of the young year happened no more than five minutes into my fishing for the year. I'm not sure whether that is a good sign or a bad one. Occurrences like that have been known to throw one's luck either way, so only time will tell if it is a good omen. The story of my first fish of 2017 actually goes back a ways. There is a New Years Day gathering that I had been hoping to attend for a while. It is not an official group putting on the event, but that is probably part of the charm. Bigsur had been doing this for the last four years and the plan was bigger and better than ever for year five. While my plan involved a lot of fishing and less socializing, I still wanted to drop in on what is really a terrific event. I made it up to the meeting place at Metcalf Bottoms Picnic Area right about the time that all the preparations were completed. Food was ready and the crowd was ready for fun and fellowship. I saw a lot of friends that I've made over the years. Still, the plan was to fish, and by the time my buddy Jayson showed up, I was throwing on waders and rigging rods. One thing I had noticed while prowling around the gathering was a fancy award plaque made by the famous Duckypaddler. Imagining how it would look above my tying desk, I started dreaming of big brown trout on the end of my line. As I was rigging up, I put together a normal nymphing setup on my five weight Orvis Helios rod and was debating what to do with the seven weight. I noticed some random tin boxes and decided to see what goodies they were holding. My smallmouth bass flies of course! A Tequeely jumped right out and asserted itself so I tied it on the streamer rod and was ready to go. Down on the stream, I intended to fish one particular hole before driving further up river to search for more fish. I made a cast or two in the back of the hole before hurrying up to the head. My goal was a serious of textbook perfect ambush points on the far bank. In other words, I was hitting prime brown trout water. I wish I could say I was a genius who knew that these trout love Tequeely flies, or that I knew that this brown trout was sitting right behind the bedrock ledge, but in all honesty, I just got lucky. 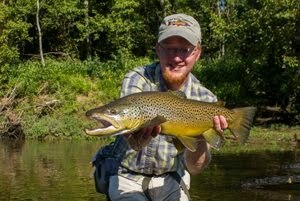 I waded in, slapped a few casts across the river, bounced the fly around a little, and a big brown blur hammered the fly. On the seven weight rod with 2x fluorocarbon tippet, the fight wasn't much, but I was just as glad to get that fish in the net in a hurry. 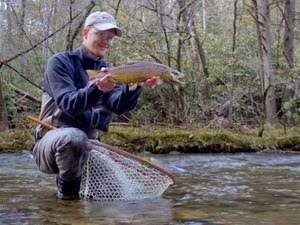 Nice brown trout don't come along every day in the Smokies, and I'm not sure my nerves would have been happy fighting the fish for an extended amount of time. I got even more suspicious about the implications for my luck after I only caught one other fish the entire rest of the day, but perhaps I'm too suspicious. The good news is that I fished again in the Smokies on Tuesday and caught some trout, so clearly there is still some good luck left. In fact, if one can believe Bigsur, winning this award guarantees all kinds of good luck in the new year. I hope he is right because a fisherman can always use a little more good luck! 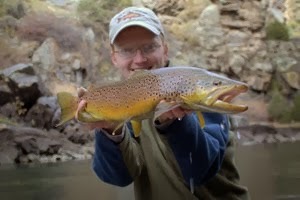 As I am trying to keep this blog mainly about my own personal fishing excursions, please check out Trout Zone Anglers and the blog there for the Year in Review posts on guided fly fishing trips. Specifically, here is the Smoky Mountain guide trips in review. The tailwaters were fishing very well this past year. The Caney Fork was about as good as it gets last year, or at least it was if you were a regular on the river and knew the tricks. 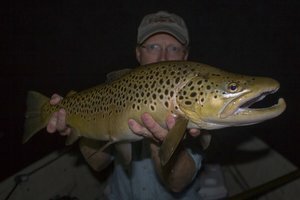 Here are the 2016 tailwater trips in review featuring more big trout than anyone deserves to see in one year. It was a glorious year indeed! Happy New Year! I hope each of you has a great 2017 that includes plenty of time on the water. I'm excited to see what the year has in store. 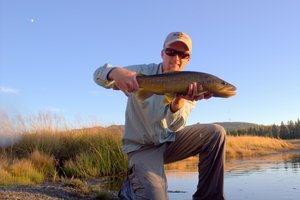 Thank you to everyone who has supported my fly fishing endeavors by reading this blog, taking a guide trip with me, or otherwise encouraging me along the way. I hope to meet many more of you in this new year!